Long past the allure of “reach” numbers in the hundreds of thousands, marketers and agencies are increasingly focusing on what matters most: engagement. And there’s no better marker of engagement than shares. Even just liking something—or clicking favorite, heart, thumbs up, whatever—is a simple action that only indicates someone took the time to click something and, perhaps, din’t even read it. Few people click through to an article, read it start to finish, then toggle back just to click “like” and move on. Your most engaged audiences are more likely to share it. And that’s why it’s the shares that count. To share something is to say, essentially, “This represents me,” or “This made me think.” You’re endorsing a piece of content by placing it on your own feed. It’s such a personal commitment that political Twitter users and influencers, particularly journalists, feel compelled to clarify that “retweets are not endorsements.” We assume that sharing content means you agree with it. It’s a very personal act. 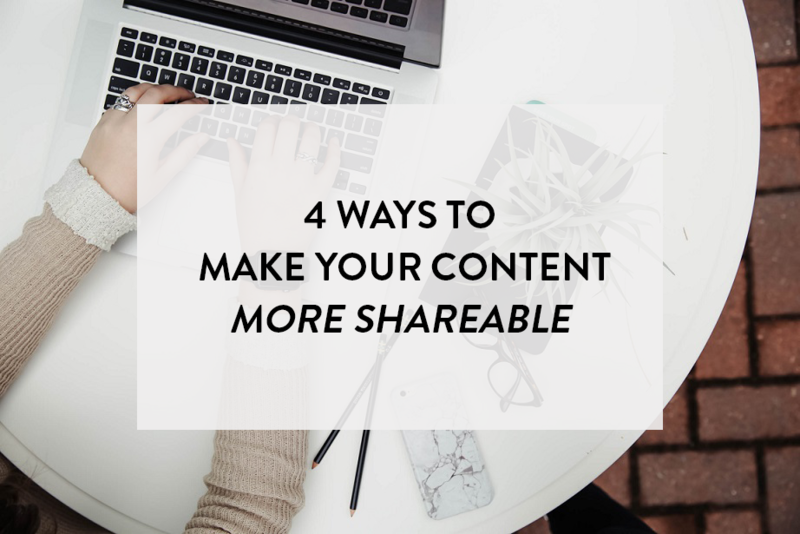 Here are a few tips to make your content more shareable. For many content marketers, asking others to share content is an odd point of pride. But why? It depends on the content, of course, but if you’ve published something you’re proud of, there’s no shame in asking people to share it. You shouldn’t take the ask for granted, of course. Asking repeatedly for readers to share everything you publish will nullify the importance of anything. But if you’re looking to make an impact with something—say, the most important post you’ve created in a while, or an informative resources that’s particularly relevant to your audience—then do it. 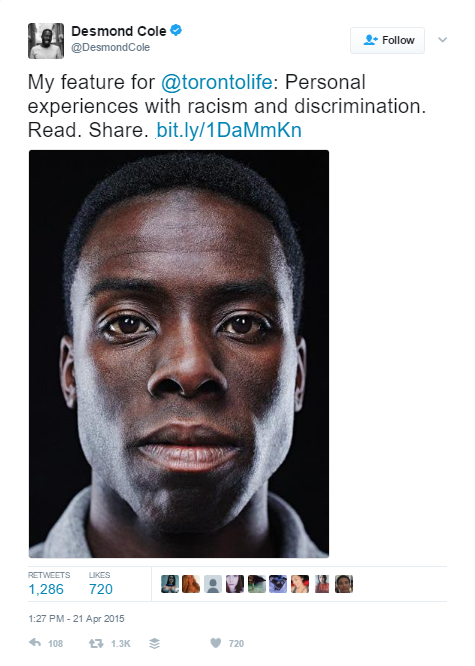 Canadian journalist Desmond Cole frequently tweets about racial and social justice issues. But when his face was on the cover of a major magazine, the story was big enough across North America that he asked people to read and share it. You might assume it’s easy for well-known people within political circles or with celebrity status on Twitter to get more than 1,200 retweets but then look at everyone who isn’t. Look at Cole’s own Twitter feed on a normal day. The engagement is nowhere near the post above. When something has impact, you want to stretch that impact by asking. Want to get more shares? Get more people to care. Social media is emotional media, and people tend to share pieces that strike them at gut level—things that make them angry, shocked or inspired. Shareable content is emotional content. Take a look at Target’s Facebook page. Any time they promote a new product or link to their site, it gets a few dozen shares. 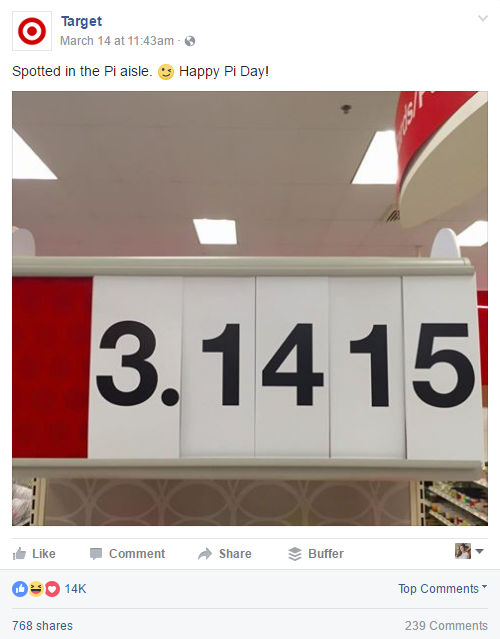 When they posted a funny pun on Pi Day, they got more than 700. People like to feel clever and tuned in, or at least passionate about subjects that make them angry, sad or overwhelmed. Knowing that you probably don’t want to make people angry—unless you do, as some marketing ploy to harness their rage against some problem you can solve—comedy and wit are solid tactics. And when it comes to this kind of content, headlines reign supreme. Make your headline elicit the emotion on its own because even many of the people sharing it won’t have read the actual article. You may have sharing widgets enabled on your site. There are dozens on WordPress and third-party apps across the web—but how many have you tested to see how easy they are to use (for you and for your readers)? Did you just use a default plugin that came with your site, or did you do the research? There are too many options for you to settle quickly on this. It’s a good rule of thumb to not choose a sharing widget based solely on one specific criteria—attractiveness, for example. Some will slow down your site considerably; others will set cookies across every page to capture visitors’ information and monetize it; more still suffer from faulty share-counting algorithms. And those are just the aesthetically pleasing options — there are plenty of others that look terrible. Take some time to research various widgets, not only for yourself but also for your customers. You may find a few that achieve better results than others. If your goal is purely to create shareable content, you’re starting off on the wrong foot. The first step is to create educational, valuable content—only then can you propel your momentum into getting huge numbers. It’s easy to get lost in the web of social media, wondering what little tweaks will increase your visibility. And those tweaks certainly do exist—see the previous three sections of this blog post. But if you’re in the beginning stages of content marketing, the most fundamental rule is to create content that informs and attracts the right audience. Review your company goals and remember why your customers enjoy your product in the first place. Tap into that and use it to fuel your subject matter. Then keep going, and give it time. The shares will come.